Historical Perspective – Trials and Tribulations. Both India and US are the greatest democracies of the word . The US being the oldest democracy and India represents the largest democracy . President Obama defined the India US relations as defining partnership of the 21st century and partnership that is based on shared democratic values deep routed in our societies. US India relations have witnessed many highs and lows . However, India-US relations have gone through a massive transformation especially in the last two decades and now blossomed into one of most important strategic partnership based on the convergence of interests which has significant impact on the prevailing geopolitical scenario. 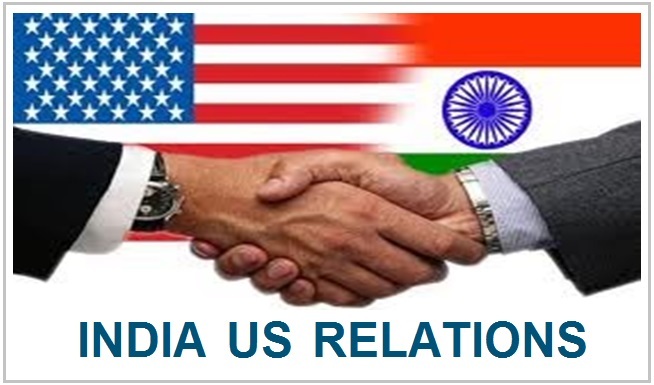 India US relations today translates into $120 Billion of trade between the two countries , India and US have signed a number of defence agreement to the extent that the US has actually now replaced Russia with over $15 Billion of weapons purchase by India in the year 2015. The strategic dimension of US-India relationship can be accessed from the fact that today US conducts a maximum number of military exercises with India as compared to any other country which is indicative of a major shift in US policies. The US has also elevated India to the status of a major defence partner which is to some extent similar to the status of a NATO country. The strategic dimension of this relationship has been cemented with the number of defence co-operation related agreements ( COMCASA , LEMOA , BECA ) . These agreements provide the necessary framework , which will allow the US to sell the latest sophisticated weapon system and share the sensitive technology with India. The evolution of India US strategic partnership as it exists today has gone through many difficult phases and can be broadly summarized and studied in two phases . The first phase includes period starting from the end of second world war till the collapse of Soviet Union in the year 1991 . This period is also referred to as US Russia cold war period . The second phase of US-India relations starts after the end of the cold-war period after Soviet Union’s disintegration. In this article, we will take a closer look at some important mile stones in India US relationship and its significance . During India’s freedom struggle period before 1947, the US had a very limited stake in India and during this period , India US relations were more or less in dormant state . Prior to India’s independence , India was a British colony and Britain had ruled India for almost two centuries . The prolonged British rule over India had completely destroyed India’s economy and just after the independence , the Indian economy was in a bad state. The US government had always supported India’s aspiration for freedom from British rule .The US then President Franklin D. Roosevelt had suggested many times to Winston Churchill that he supports India’s independence movement and suggested for earliest resolution on this issue . In the year 1942 , Mahatma Gandhi had written a letter to the US president to clarify his stand on India’s freedom and seeking his support to end the British rule in India . However, the US support soon diminished after the Indian National Congress decided not to support Britain during the second world war and decided to launch the Quit India movement against British rule. As a result of intensified India’s freedom movement and the formation of Indian National Army by Netaji Subhash Chandra Bose , The Britain had to concede to India’s freedom. India got independence in the year 1947 and the constitution of India came in to force on 26th January 1950 which is celebrated as Republic Day every year . India’s post independence period after 1947 dominated the India US relations. The events such as India-Pakistan war over Kashmir and the prevailing cold war between the US and the erstwhile Soviet Union had a significant impact on the foreign policies pursued by both the US and India . Both these events had a significant impact on the India US relations during this period. India’s independence and end of British rule over India also resulted in the partition of India marked by the birth of Pakistan as an independent country. The partition of India and consequential birth of Pakistan had a significant impact on India’s post-independence foreign policy. The British had partitioned India on the basis of religion. The majority Hindu , Sikh , Christens and other minority population became the part of newly formed India whereas the majority Muslim population area became the part of Pakistan. The king of Kashmir decided to join India despite the sizable Muslim population. Since then , Pakistan has made many unsuccessful attempts to forcibly occupy the Indian Kashmir but India has defeated Pakistan in all the wars fought so far. Both United States and the Soviet Union had fought together as allies against the Axis powers during the second world war . Although, the US had major differences the Soviet Union over expansionist policy pursued by the Soviet Union in Eastern Europe . America viewed this as a Russian plan to control the world . After the end of second world war , The differences between the two nations soon deteriorated in to complete mutual distrust and turned in to the open hostility . The cold war period also witnessed the massive buildup of nuclear weapons and delivery systems by both the countries . Eventually, the cold war ended with the disintegration and the collapse of Soviet Union in the year 1991. The US Pakistan relations had a profound impact on India-US relations. The US was one the first few countries to establish diplomatic ties with the newly formed state of Pakistan. Pakistan needed a crucial financial and military assistance in order to wage a war against India over Kashmir issue. For the US, Pakistan tuned out to be an ideal choice for providing arms support to Mujahideen fighting against the Soviet forces present in Afghanistan. The Soviet Union had sent its military troops in Afghanistan in 1979 to protect the communist government in Afghanistan . Pakistan formally joined the US alliance against the Soviet presence in Afghanistan and became an integral player in the CENTO and SEATO. Pakistan provided all the necessary support to the US in channelizing funds , arms support to various Mujahideen groups fighting to evict the Soviet forces present in Afghanistan. During this period , Pakistan was rewarded by the US with huge financial assistance and the latest weapons which Pakistan mainly used against India. The Indian government had strongly objected to the US policy to provide the latest weapons to Pakistan. However, despite India’s objections, the US massive financial and military aid continued to Pakistan . And with the help of this US aid , Pakistan managed to build its armed forces and also channelized the money for its secret nuclear weapons program. By this time Pakistan had become a fertile ground for various militant and terrorist groups operating in Indian Kashmir. The latest American weapons provided necessary immunity to Pakistan against possible Indian military action . However, the situation dramatically changed after the collapse of the Soviet Union and Soviet forces pulled out of Afghanistan. The US government constrained to act against Pakistan when Pakistan detonated and tested a nuclear device with the help from China. The US approved and imposed sanctions against Pakistan by passing the Pressler amendment . The US open financial and arms support to Pakistan and a complete neglect of Indian interest by the US became a major stumbling block between India US relations. The US-Pakistan relationship also pushed India closer to the Soviet Union despite its stated position of non-alignment. Russia also provided India diplomatic support in the United Nations ( UN ) on many resolutions initiated against India . Russia also provided India arms , training and financial assistance . In response , India refrained from going against Russian military actions in eastern Europe and Afghanistan . India-China war broke in 1962 with the invasion of India by the Chinese army . Indian leadership led by Prime Minister Jawaharlal Nehru had maintained fairly good relations with China. However, the Indian leadership had caught completely off-guard with unprovoked Chinese invasion . The Indian leadership led by PM Jawaharlal Nehru had never expected this war and the Indian side was just not ready for this invasion by China. The Sino-India war could not get much attention and was over showed by the Cuban crises. During this period , US President Kennedy was preoccupied in dealing with the Cuban crisis could not actively engage on India-China conflict. China being the communist regime and India being the democracy, US had come to India’s rescue and provided the diplomatic and arms assistance to India during this conflict. The Sino-India war continued for about a month and ended on 21st November 1962 when China unilaterally declared a ceasefire. The US support to India in this war created a lot of goodwill. The US had even kept the plans ready for direct military intervention by sending the aircraft carrier USS Kitty Hawk to the Bay of Bengal to provide the necessary military support to Indian armed forces fighting against Chinese invasion. India lost this war because China had been planning for this attack whereas Indian leadership failed to anticipate this attack . Further , the Indian army had not prepared for this war and as a result, 20000 Indian troops fought against 80000 strong Chinese army troops. For strange reasons, India did not use its airforce in this war , although Indian air force was much stronger as compared to Chinese airforce. President Richard Nixon’s open support for Pakistan and acceptance to Chinese dominance in Asia created a major rift between India US relations. During Nixon’s Presidency, India-US relations consistently deteriorated. President Nixon followed a policy of rapprochement with China and deviated from the US policy of containing China which was a major shift in US Policy . President Nixon’s pro-China-Pakistan policy compelled the Indian government led by Prime Minister Indira Gandhi to create a counterbalance by aligning with Russia. President Nixon’s pro-Pakistan policy and complete ignorance to the genocide and atrocities carried out by Pakistan army in East Pakistan ( Sunday Times Of London Report on Genocide in East Pakistan ) constrained India to send troops and intervene to liberate Bangladesh ( East Pakistan ). The crisis in East Pakistan ( Bangladesh ) resulted into India-Pakistan 1971 war. The Indian victory in 1971 war paved the way for India’s emergence as a regional power. In response to US pro-Pakistan and pro-China policy, India decided to go ahead and signed the “Treaty of Peace, Friendship and Cooperation” with the Soviet Union. This treaty assured India of material and diplomatic support in case of a war with Pakistan and also against possible US military intervention to support Pakistan. In post-independence era , Pakistan had already developed close relations with the US and Pakistan had become a key element of America’s Afghanistan policy directed against the Soviet military intervention in Afghanistan . The US continued arms and financial assistance to Pakistan which pushed India closer to the Soviet Union. Russia also provided financial aid and arms to India on many favourable terms. However, due to India’s proximity to Russia, US always perceived India belonging to the Soviet camp and the relations remained strained between the two countries. During this time , India had perused its policy of non-alignment and also never acted against American interest. Armed with superior US weapons, Pakistan invaded India in the year 1971 and this war is also referred to as Bangladesh liberation war . The Indian government and the army had anticipated this move by Pakistan and the Indian side was well prepared to respond to this Pakistani invasion. The atrocities and genocide by Pakistan army in East Pakistan triggered massive exodus of refugees from East Pakistan into the eastern Indian states . In this war , India defeated Pakistan , although Pakistan was far better equipped with the latest American weapons. This war was fought by India and Pakistani militaries simultaneously on both the eastern and western fronts. In a swift military operation , the Indian army defeated Pakistani forces on both the fronts and captured East Pakistan . The war ended with the partition of Pakistan and separation of East Pakistan as an independent country Bangladesh. Despite Pakistani Army’s atrocities and genocide in East Pakistan , The US government choose to remain silent and supported Pakistan during India-Pak 1971 war. Then US Secretary of State Henry Kissinger had even visited Delhi to pressurize the Indian government against the Indian support to the liberation movements in East-Pakistan. However, the Indian government under the leadership of then Prime Minister Mrs Indira Gandhi refused to get intimidated by US intimidation. In anticipation of US military intervention to support Pakistan, India went ahead and signed a “Treaty of Friendship, Peace and Cooperation” with the Soviet Union to counter the US military intervention. This Indian step was viewed the US as a major shift from its stated policy of Non-Alignment. Then US President Richard Nixon in a retaliatory move decided to amend the US policy in favour of Pakistan . The US also penalized India by suspending $87 million worth of economic aid to India. During the war , US had even dispatched its naval fleet USS Enterprise in the Bay of Bengal. However, the Indian Army had already captured East-Pakistan. India won the Bangladesh Liberation War and Pakistani Army had to surrender more than 90,000 soldiers . This war formally ended after the Eastern Command of the Pakistan military signed the Instrument of Surrender with the birth of Bangladesh . After the victory in the 1971 war with Pakistan, India had now emerged as South Asia’s major regional power. India and Pakistan had also agreed to resolve Kashmir issue with mutual consent without any third party intervention and signed Simla Agreement ( July 1972 ). The cold war ended with the collapse of Soviet Union . By this time Indian economy had gone through a major economic reforms and liberalization . The Indian market had also become very lucrative which had huge potential for the US companies . The end of the cold war also paved the way for new chapter in India US relations. With the exit of Russian forces from Afghanistan, Pakistan also lost the positional advantage it enjoyed during the cold war period . The collapse of the Soviet Union was an equally important event for Indian foreign policy as most of the provisions of “Treaty of Friendship, Peace and Cooperation” with the Soviet Union also came to an end . Even after disintegration of Soviet Union , both India and Russia continued to develop the relations. Russia still continues to be the largest supplier of arms and defence equipments to India . India has always been a strong advocate of elimination of all nuclear weapons . However , India refused to sign the Non-Proliferation Treaty ( NPT) proposed by the world’s leading nuclear powers who are also permanent members of the UN security council . India refused to sign NPT on the grounds that it is discriminatory in nature because it allows some countries ( US , Russia, China , UK , France ) to possess nuclear weapons whereas it prohibits remaining countries to develop nuclear weapons. China conducted the first successful nuclear weapon test just after the Sino-India war in year 1963 . The Chinese test triggered a great deal of insecurity amongst Indian leadership and defence planners . The Indian government also had knowledge about Pakistan’s secret nuclear weapon program. China actively supported Pakistan’s secret nuclear program in terms of technology and uranium supply . This has helped Pakistan to become the first Islamic nuclear power state . Under these circumstances , the Indian government had left with very limited options and decided to go ahead with an indigenous nuclear weapons program. India conducted the first successful nuclear weapon test in the year 1974 with project code name “Smiling Budda”. This first underground nuclear test was conducted at Pokhran in Jaisalmer district ofthe state of Rajasthan . Then Prime Minister Of India , Mrs Indira Gandhi authorized the Bhabha Atomic Research Centre (BARC) to manufacture a nuclear device and prepare it for a test . The Smiling Buddha nuclear bomb was detonated on the army base, Pokhran Test Range ( PTR ) under the supervision of many key military and civil authorities . The Indian nuclear weapon test initiated the formation of Nuclear Suppliers Group ( NSG ) in reaction to the Indian tests with an objective to check the proliferation of nuclear weapons. Both Canada and the US were the main source of uranium suppliers to India . In reaction to these test , Canada decided to hold the future uranium supply and concluded this test as a violation of 1971 understanding between the two countries. When India conducted the first nuclear test, in 1974, already strained US-India relationship further deteriorated . The United States blacklisted India’s civilian nuclear energy program and imposed sanctions on its imports of essential dual-use technologies being extended to India. However , These sanctions were soon released which was indicative of US’s gradual acceptance of India’s legitimate need to acquire minimum credible nuclear deterrence against China and Pakistan . The United States did not treat the test as violation of any agreement and proceeded with shipment of enriched uranium to India for Tarapur reactor in year June 1974 . The US was very much aware of the Chinese help being extended to Pakistan’s secret nuclear weapon program . China had also provided critical missile technology to Pakistan for the delivery of nuclear weapons. It was soon revealed that China had supplied M11 missiles to Pakistan . However, the US did not apply sanctions on China for violating the MTCR provisions , although this was an irresponsible blatant violation of MTCR provisions by China. The economic and trade relationships had significantly improved between the two countries by this time and the economic arm of India US relations has constrained both the countries to move forward. The US was willing to accommodate India’s defence needs. Both the countries started taking concrete steps for co-operation in the fields of defence and technology transfer for local defence production. For the first time in 25 years, Indian defence minister K. C. Pant visited the US in July 1989 to take the US-India Defence relation to the next level. This visit was followed by the visit of the US Secretary of State Caspar Weinberger in 1987 and again by his successor Frank Carlucci in 1988. President Ronald Reagan had also issued a directive (1984 ) to the various US government agencies instructing them to seek improved relations with India and accommodate the Indian requests for dual-use technology. India had recently started indigenous combat plane development project LCA Tejas and US agreed to supply General Electric F404 engines and avionics for this project . Subsequently , US also agreed to sell Super computer Cray XMP14 to India which was indicative of significant improvement in relations and a shift in US policy towards India . The supercomputer sale to India became the first such sale to a country outside the western alliance. President Bill Clinton’s tenure was a major milestone in India-US relations . By this time , India had already emerged as a major regional power and with successful nuclear weapon tests in 1974, India had effectively joined the selected group of countries armed with nuclear weapons. President Bill Clinton visited India year 2000 after a gap of 22 years by previous US president. President Bill Clinton’s visit must get the due credit for bringing the spotlight on the importance of India US relations in years to come. Even after his retiment Predident Bill Clinton travelled to India many times . President Clinton was also appreciated by India for his neutral stand on Kashmir issue and his acknowledgement of Pakistan’s role in causing voilance in Kashmir , involvement of militant groups from Pakistan in violent activities in Kashmir. As described by TIME magazine , President Bush was a true friend and well-wisher of India . President George Bush tenure was another important milestone in shaping India US relations. Both President Bush and Prime Minister Manmohan Singh enjoyed excellent rapport . The chemistry between the two leaders took the India US relations at a completely different level. President Bush’s personal initiative also laid the foundation for US-India Civil Nuclear Agreement ( Also referred as 123 Agreement). President Bush also managed to convince Indian leadership for the first time to separate its civil and military nuclear facilities. India also agreed to place all its civil nuclear facilities under International Atomic Energy Agency ( IAEA ) safeguards. Under the agreement, the United States agreed to work toward full civil nuclear cooperation with India . US also managed to get the exemption for India from the Nuclear Suppliers Group ( NSG ) . The NSG waiver for India allowed India to access civilian nuclear technology and fuel from other countries. The NSG is an export-control group of 48 countries and cartel that had been formed with the objective to stop the proliferation of nuclear weapons . The NSG was formed mainly in response to India’s first nuclear test conducted in 1974. The terrorist September 11 attacks in US had a major impact of US policies and war on terrorism became one of the important agenda for US government . The Bush administration announced a war on terrorism. The US agencies started the hunt for the terrorist group responsible for these attack and soon identified Osama bin Laden and al-Qaeda responsible for these attacks . The US soon realized the danger of radical militant groups operating within Pakistan with the active connivance of Pakistan military and ISI. The US started military action in Afghanistan targeting Taliban and Al-Qaeda camps. The US soon started a full-fledged war on terrorism and later on invaded Afghanistan by deploying ground troops in Afghanistan . The September 11 attack on the US has triggered major shift in US policies and a complete eye-opener for the US. The US soon realized the pain of being a victim of the terrorism which India has been inflicted upon for a long time. President Barack Obama continued the momentum in India US relations . President Obama first worked with Indian Prime Minister Manmohan Singh and then with Prime Minister Narendra Modi during his second tenure as president . The year 2014 also witnessed a change of leadership in the Indian government . The UPA led by Congress party lost the elections due to corruption allegations and the NDA came to power in India with the massive mandate under the leadership of Prime Minister Narendra Modi . Prime Minister Narendra Modi visited the US and struck a very good rapport with President Obama . President Obama visited India twice during his tenure. The war against terrorism was top on the agenda for both the leaders. The US continued its military operations in Afghanistan against various terrorist groups . The US special forces also located and killed September 11 attack mastermind Osama bin Laden hiding in the safehouse in Pakistan. Osama bin Laden’s presence in Pakistan came as a complete loss of credibility for Pakistan and an eye opener the US . By now, US had discontinued most of the financial assistance and arms supply to Pakistan. President Donald Trump became the next president of the United States in 2017 after winning most fiercely fought US elections. During the election campaign, President Trump made it clear his priorities such as “America First”. President Trump himself being a successful business tycoon had a different outlook to American policies as compared to his predecessors. During his election campaign , President Trump made many pro-India statements and described himself as India’s best friend in Whitehouse . He also highlighted his serious concerns about the threat of terrorism. The issue related to illegal immigrants in the US and ban on the entry of a particular community in the US became another controversial issue. The US has a sizable number of Indian community which is now roughly estimated to be 1% of the total population. The majority of the Indian community supported Trump’s candidature for US president. Although the US has made a sizable dent into the Russian dominance in Indian mega defence deals and even dislodge Russia in 2015 with $15 Billion worth of defence purchases signed by India with the US companies. The US Senate passed “Countering American Adversaries Through Sanctions Act” ( CAATSA ) act to impose sanctions on Russia, Iran and North Koria . The act authorizes the US President to initiate punitive measures against countries dealing with these three countries . President Trump has already voiced his concerns about passing this law and described this law as flawed. Under the provisions of this act , the US has already imposed some sanctions on China for the purchase of S-400 air defence system from Russia . India too wants to purchase this system from Russia . The US administration has repeatedly warned India against defence deals with Russia asking not to go ahead with S-400 deal. However , despite these warnings , India has gone ahead and signed a deal with Russia . Russia has been a major supplier of defence equipment to India for the last seventy years . US administration so far has not imposed any sanctions on India as such a move will be counterproductive and jeopardize all major defence deals in pipeline with India . Although there is a considerable amount of convergence of interest between India and US . However, the differences are visible on some issues. The US expects India to play much bigger role by deploying its armed forces along with US forces deployed in Afghanistan . Whereas , the Indian side is not in favour of deployment of Indian forces in Afghanistan . The Indian government is already providing support in terms of huge financial assistance , training for Afghan military personnel and arms for Afghanistan forces . India has also initiated and constructed many development projects in Afghanistan. President Trump is a vocal critic of India for its existing tariff barriers and describes India as “Tariff King” on public forums . The India US trade amounts to $120 Billion which is in India’s favour. The US has recently imposed the tariff on many Indian commodities and Indian government so far has not imposed the counter tariff on US commodities being supplied to India. This is another issue over which both the US and India are on logger’s head with each other . Due to the Trump administration’s hardline anti-immigration approach , there has been a sizable reduction in H1B visa application filing by Indian Companies operating in Silicon Valley in the IT sector . As a result of these policies , large number highly skilled IT professionals are now opting to rather work in India instead of US posting. The effect of these policies are now visible and the Wall Street Journal has recently reported 548000 vacant positions floating in the US job market which is going to adversely affect the US companies . For , India it is a “Brain Gain’ and blessing in disguise . The relations between the US and Pakistan have reached the lowest level due to Pakistan’s blatant support to terrorist militant groups operating from Pakistan. President Trump is vocal about these issues with Pakistan from day one and consistently criticized Pakistan for its involvement in supporting terrorist groups present within Pakistan. The Trump administration has already discontinued all financial assistance and arms supply to Pakistan for failing to act decisively against terrorist groups present in Pakistan. The US has also blocked Pakistan’s attempt to get another bailout package from IMF and that money cannot be used for interest payment for Chinese extravaganza in Pakistan . Both India and the US have a great deal of convergence of interest on major issues . The transformation of India US relations into strategic partnership is important for the regional security . The emergence China is not going to be peaceful and the Chinese expansionist policies will create major conflicts in future . India and US need to focus on major strategic objectives and the differences on some issues should not be allowed to dilute the focus on strategic objectives important for both the countries. Do let me know what you think about India US relations. I am keen to hear from you. Should India also acquire S-500 SAM ? Yes . India should . No . India need not . I am not sure . Find out what is S – 400 SAM ? All Rights Reserved . © 2019 India Defence News .